Ainslie School's P&C Asociation have established two community gardens through grants and fundraising. This project runs in conjunction with the school's Fresh Tastes program with the vision that fruit and vegetables will be grown within a kitchen garden model. More information can be found on the community garden page. This lunchtime club is facilitated once a week to discuss current environmental and sustainability initiatives. This group has led energy and waste audits across the school and annual initiatives like plastic fee July, been involved with Tree Planting Days, World Environment Day, Walk or ride to School Day and various waste competitions. In addition, recycling stations have been established within classrooms and across outdoor areas of the school. In the past this group has been responsible for maintaining the existing vegetable patches, establishing a communication strategy across the school about environmental and sustainability issues, growing herb seedlings for the school fete and maintaing compost for the gardens. 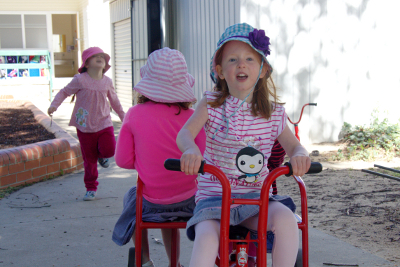 The Kids Teaching Kids Program promotes positive wellbeing and helps build resilience in young people. It raises awareness and drives action on local and global environmental issues, bringing communities together to solve common challenges and help the next generation of leaders who will take collective responsibility for our future. Ainslie School is a proud participant of this program. Both Reid Preschool and Ainslie Baker Gardens Preschool have well developed sustainability intitiatives like composting, chicken farming and recycling. In 2007, Ainslie Baker Gradens won the Education Category of the No Waste Awards as well as a sustainability grant. Further information can be found at Australian Sustainable Schools Initiative - ACT.